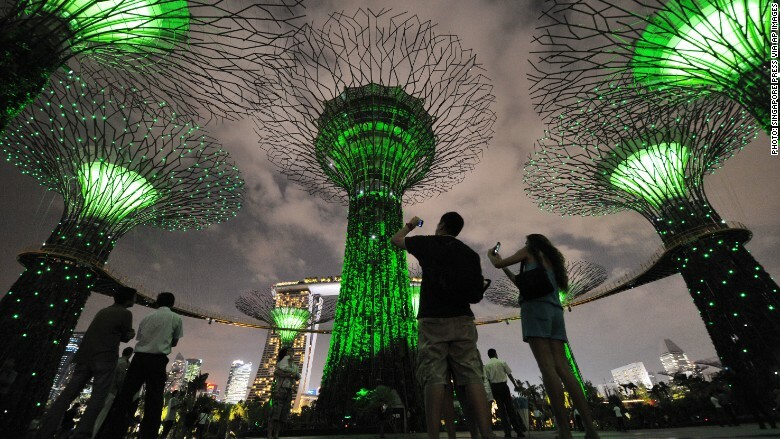 An ultra-connected future can be beautiful or scary, just like these high-tech "Supertrees" in Singapore. Smartphones and mobile devices have given each of us a 'second brain,' allowing us to navigate new cities without getting lost and speak fluently in different languages. These devices, which have made our lives increasingly convenient, are soon going to shift from our pockets to our inner bodies -- think iris overlays and brain implants -- making us more networked and connected than ever before. Clearly, the irresistible, joys and conveniences of mobile connectivity are too many to list, and avoiding them is surely an exercise in futility. Yet, in the near future, I predict a string of disturbing, unintended consequences will start to let the air out of this inflated, hyper-connected bubble. When we share pictures of our kids on Flickr, we probably don't expect to see them turn up as faces on coffee mugs for sale on website Koppie-Koppie. Using Twitter (TWTR) to comment on politics wasn't supposed to land us in jail, as is happening in Turkey. Liking a company on Facebook (FB) wasn't supposed to result in a marketing free-for-all. Having a mobile phone with a SIM card wasn't supposed to provide a perpetual backdoor to government security services that want to listen to our calls. The list is endless, but this is only the very tip of the iceberg. The possibilities of abuse are abundant. Over five billion people, and 100 billion 'things,' are expected to be connected to the Internet in 2020 -- many through wireless, mobile devices. Ubiquitous connectivity and exponential improvements to technologies, such as artificial intelligence, are becoming akin to nuclear power. The technology is very promising and beneficial, but once deployed, if something goes wrong, we have no idea how to stop it. The possibility of catastrophic destruction sits right next to legitimate positive outcomes. We need standards and rules to channel this enormous power. Consumers want powerful technologies that make their lives easier, richer and more productive, but they won't use mobile devices and networks if it means a creeping 'robotization' of our society, a descent into digital addiction, a loss of personal privacy and unwarranted surveillance. Sure, most of us are still enjoying the new superpowers of mobile technology and ultra-convenient apps, maps and smart digital assistants. It's all still so new and cool ... many of us couldn't care less about becoming virtually naked. But you can be certain that sometime soon, many of us 'digital natives' will begin to object forcefully to living inside an enormous Big Data bubble where we are no longer the masters or beneficiaries, but have become mere cogs that are subjected to hyper-marketing and surveillance-by-default. The game has changed and the mobile industry had better take note. Industry leaders are well advised to think ahead. It's no longer just about connecting people. It's also about what happens once they are connected. Few consumers will be excited about digital money, wearable devices or mobile health services if weak data protection standards, outmoded social contracts and shaky digital ethics prevail. It's time for encryption as a default, public digital data standards and global rights that are respected by everyone.